SCS Software are dedicated to realism in their simulation games, but with American Truck Simulator they’re taking this authenticity to the next level. People have been asking the developers to incorporate real-world events into their game, and they just delivered. If you prefer breaking the rules, check out our list of the best racing games. 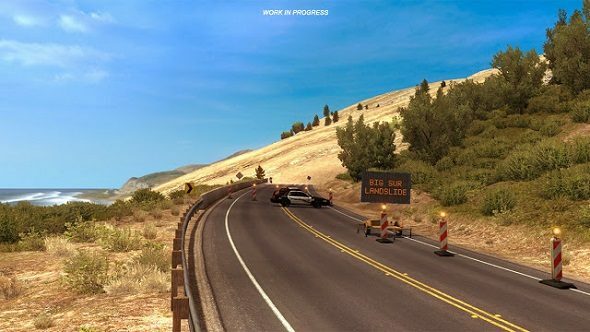 The developers just closed part of California’s Highway 1 in-game, blocking it off with a police cordon. Players hoping to pass through will have to take an alternate route. This is because of the Big Sur landslide, which buried a portion of the highway in June this year. That means one million tonnes of rock need to be moved to make the road usable again, and that’s before repairing any damage caused. It covered 13 acres of land. In real life, the highway has been closed since January, in anticipation of such an event. There’s no timetable on when the road will be usable again, but presumably the one in-game will be cleared up around the same time.